If so, this book is for you. Through the chapters of this book, each question type on the TOEFL is explained as well as strategies for choosing the correct answer. It also includes plenty of practice questions with explanations. That way, if you get an answer wrong, you will know why and learn how to avoid falling into those traps on the actual TOEFL test. This book is certain to help boost your score on the Reading section of the TOEFL iBT. TOEFL is a registered trademark of the Educational Testing Service, which does not sponsor or endorse this product. This book assumes you already have basic knowledge of the TOEFL, such as how to register bring to the test site, and so on. I won’t bore you with all that information. You can find the information on those topics at www.ets.org/toefl. The purpose of this book is to teach you str to answer each question type that are straightforward, direct, and simple. With these strategies prepared and confident to take the Reading section. The TOEFL is a costly, stressful test. I w get your goal score so you can move on with your life. So let’s talk TOEFL. The Reading section comes first on the TOEFL test. As I’ve said, I’m not going to bore you details about how the TOEFL is formatted, but a quick review is probably a good idea. The TOEFL Reading section has 3 or 4 reading passages. If you have three reading passage hour to complete the reading section. If you have four, you have eighty minutes. You’re given in TOTAL—which means if you’re done one passage quickly, you have more time for then you can see, this divides up to twenty minutes per passage. You must be very careful not to minutes. The most common mistake students make is when they take too much time on the f reading passages and do not have enough time to finish the third. Obviously, this impacts t big way! Now, if you’re given four reading passages, there is good news and bad news. The b they are not going to score one of those passages. They’re putting it on the test to try o material. The good news is that if you have a longer reading section, you will have a sh section. One more word of caution: if you get four reading passages, do not try to guess which ready not be scored. Do your best on all four. Each reading passage has 12-14 questions. Most questions are worth one point. The summary question at the end is worth 2 points, and chart questions are worth 3-4 points. If any question is worth point, it will be indicated in the directions. READ ALL DIRECTIONS CAREFULLY. The can get on the reading section is 30. One thing that is very important for you to understand before you take the TOEFL: a lot of what they aren’t experts or don’t have degrees in the subjects on the test. These subjects c psychology, history, art, archaeology, astronomy, biology, biographies, and so on. But this is a and only a language test. As such, all the information you need to answer the ques given to you in the passage. Thanks Kathy for this amazing book. Really, I like it. 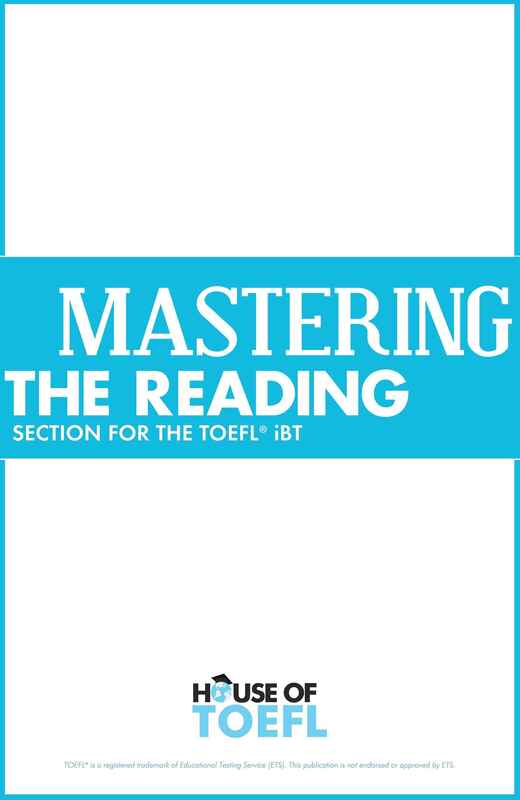 I mastered the reading section of the TOEFL iBt from your book, and I recommend it for all students who are seeking a good score in the reading section. I highly recommend this book for TOEFL reading section. It’s an amazing book, you don’t need any other source for reading section if you are using this book. You have to just follow the writers instructions. Each section is very well explained and provided with lot of practice sections. Excellent and concise. Each question type is laid out and explained clearly. Unlike most TOEFL books, this one was much more student friendly. While most TOEFL books seemed to be geared toward teachers and courses, this one was like a guidebook for TOEFL students studying on their own. Highly recommended. I really like this book. by reading this book, I'm getting better in reading section. This book is very helpful. Has a lot of practice and practical strategies. Your time in this book is valuable because you don't waste your time on reading a lot of instructions. Thank you Kathy! You did a great job, this book is very helpful. I had a trouble with the reading section of the TOEFL. My problem is that I was running out of time. However, your book tought me a strategy, which helped me a lot! Thanks again.